The eCadet scheme is the first structured peer-empowerment esafety scheme, which trains and supports a team of pupils to be able to help classmates to stay safe online. From 5th September 2016, new statutory guidance from the DfE will come into force. It requires EVERY school to put in place strengthened measures to protect children online. 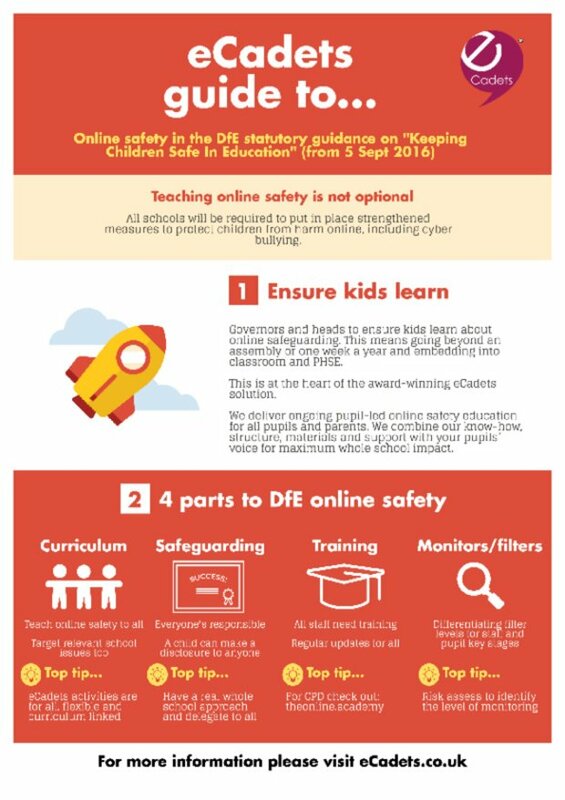 The Keeping Children Safe in Education report has introduced several new responsibilities for schools targeting different areas of online safety, including cyber bullying. To help you get your head around these changes (and the best way to tackle those new responsibilities), our friends at eCadets have produced this user-friendly guide. Just click on the image to download the guide.